The Bath Ball utilises a patented technology with chlorgon and KDF which will eliminate dirt, sediment, odours and chlorine that causes dry, itchy, flaky skin, brittle hair, eye, lung and sinus irritation. Added benefits are your bathtub will stay cleaner longer because the filter reduces lime scale, mold, and mildew deposits and helps to soften your water naturally (without adding salt) leaving your skin supple and smooth and your hair soft, silky and manageable. Inhalation and skin absorption of chloroform and chlorine by-products are greatest in the shower and in the bath, where these gases are vaporised. Sprite Bath Filters are great for people with skin allergies, asthma and eczema. Please note bath filters need to be replaced every 50 baths. 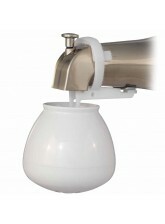 The Bath Ball Filter is perfect for people who want to fill their bath easily with clean, filtered water. The size of the replacement filter is 8.5cm wide, and 2.5cm high. The filter is very easy to replace. 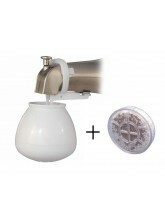 Simply unscrew the top of the bath ball filter form the bottom, remove filter, replace with the new filter. Screw the bath ball back together again. • The patented filter is non-toxic and recyclable. • Each replacement cartridge filters approximately 50 full baths.